As usual, I have spent most of the summer at home hiding from the hot sun. (Oh, how I love air conditioning!) I've been watching too much DIY Network and thinking about my next big DIY project -- redoing the bathroom. The harsh sting of reality. :P It's time to get creative! I started a Pinterest board to gather ideas. Next, I have to figure out how to replace the flooring... a portion of which is, of course, underneath the toilet. Champagne tastes on a beer budget, my father used to say about me. But I know whatever you come up with will be amazing, Bane! My taste for carved wood and wrought iron is not so budget friendly. ;) But small budgets force one to be creative, and increased creativity is never a bad thing. I love the first vanity. It is gorgeous. What kind of floor is it? I had an apartment once with green carpet in the bathroom... I'm still baffled as to why that happened. Good luck! I think that first vanity is my favorite. I love the metal on the doors. The current bathroom floor is beige ceramic tile, mismatched and poorly installed. I want to replace it with dark wood-look vinyl plank, which will be waterproof and comfortable to walk on (unlike the crooked tiles, which poke my feet with their raised edges). I'm kinda bored of white or blue bathrooms; If I had the chance, I'd build a darker, rustic bathroom with wooden floor and window frames, stained glass blocks in the wall and lots of plants. I'm still pondering how to make dark wood work in my bathroom, which is very small and has no window. It could easily turn into a dark cave if I'm not careful. I love stained glass! Now this will be interesting! Thanks! If I can achieve 25% as great as the first two, I will consider that a success. Sounds great! I don't know if you have any places like this near where you live: We have this place called Reverse Garbage where you can buy "one man's junk" things like cellphane, old chests of drawers, shelves, old bits of phones, it changes as stuff goes in and out. You never know you might find some old wrought iron, things like that. I saw an old chandelier at a old dusty Vintage shop once. Keep an eye out for places like that in your area. And good luck! There are several secondhand stores in the area, though none with a name as cool as Reverse Garbage. :D A couple of them specialize in salvaged building materials such as cabinets, flooring, and sinks. 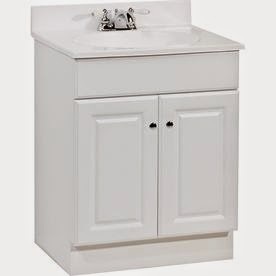 Would it be possible to find a nice second-hand dresser and cut a hole in the top for the sink? It seems like it would give you much more flexibility in terms of style and budget. Absolutely, if I can find one small enough to fit in my small bathroom (and my small car!). I have the measurements and I'll be keeping an eye out for suitable pieces. Hey I have a suggestion. 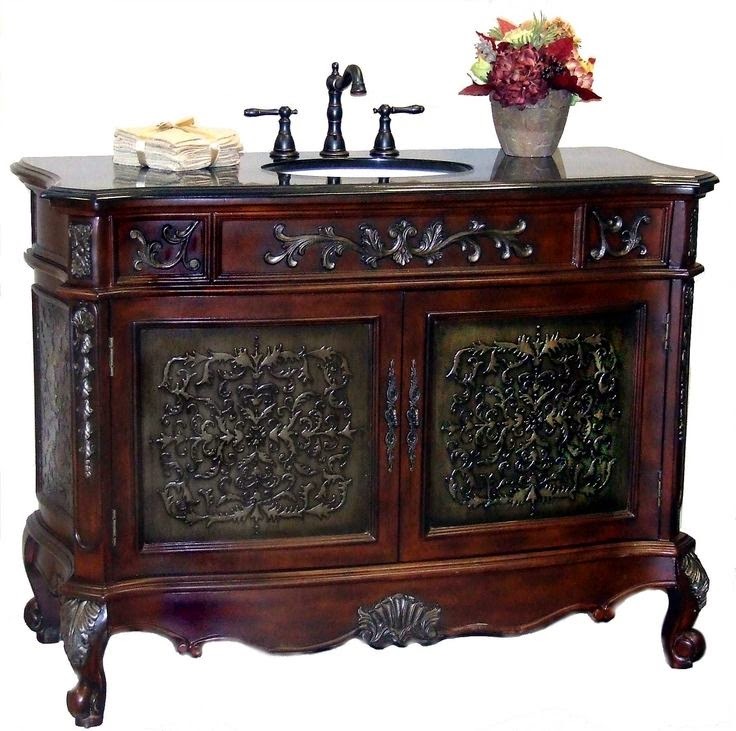 Look for antique cabinets to build a sink in. This is very popular in Sweden. It's popular here as well. I've looked at local secondhand shops, and I'm planning to visit a couple more this weekend. Sorry if this comes as a duplicate post, but I have a board on Pinterest that you might find inspirational. I recently saw some vanities made from antique sewing machine bases and dressers. 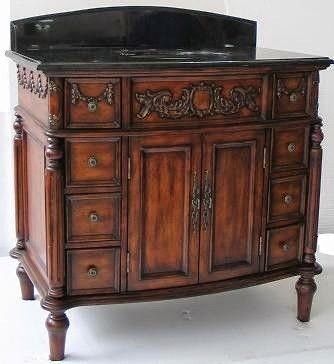 I think using an old dressing vanity would make a great bathroom vanity (add legs to raise height). Great board! The metal sewing machine bases are fantastic. Ideally, I will find a secondhand something-or-other to use as my vanity, but I'm limited by size. The vanity can't be more than 24" wide. Welcome back! Love the first vanity. There may be a ReStore near you - run run by habitat for humanity, full of cool stuff cheap. Thanks! It was actually a ReStore where I found the headboard that I bought a few days ago. They had several vanities, but all were too big for my small bathroom. I'll keep checking because their stock rotates pretty quickly. Ha ha... yeah, I have a similar problem. I have 1,000 ideas by only 7 rooms to implement them in.